Skilltrade wanted to offer easier access to Hydrography Training and therefore developed 3 interactive on-line structured e-learning courses that can be followed by anybody interested in the subject at hand. 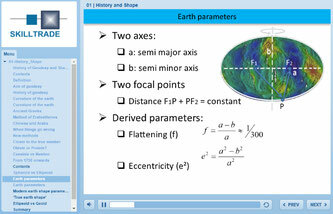 The e-learning is also a part of the Hydrographic Survey Category B Course. The modules are presented as a Power Point video with an overlay of spoken instructions. Every E-learning lecture is accompanied by an interactive assessment, after answering the questions the results are immediately available from the E-learning system. The student can connect with the experts through e-mail. Optional support through video conferences can be booked via the Skilltrade office. The modules will be kept up to date constantly. The courses are conducted in English and require a good command of English.